Because a crown is fixed over the remaining tooth it is sometimes known as a 'cap'. 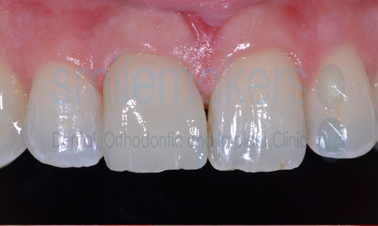 Gareth attended Smilemakers unhappy with the appearance of a very large filling on his upper right central incisor. He had broken this tooth through an unfortunate accident and wanted an aesthetic, long-term solution. 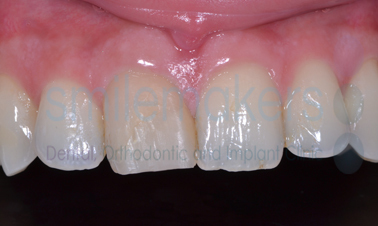 After discussing the options, a solution was found in a beautifully crafted ceramic crown, giving a natural result. Crowns are used for a number of reasons, mainly where veneers or dental bonding restorations don't provide a strong enough solution. What is involved in having a crown? Once the tooth is shaped, impressions will be taken and sent to the dental technician, along with other relevant information. A temporary crown is fitted whilst the final crown is made (this usually takes a couple of weeks). A post crown is a crown fabricated over a man-made core which is retained by inserting a post into the root of the tooth. They are used when insufficient tooth structure remains to retain a crown. A post can be made of prefabricated stainless steel or white composite material which the dentist can fit directly into the root canal, or a custom-made post can be constructed by the dental technician to accurately fit the shape of the prepared root canal. The different types of crowns each have their own characteristics and strengths and weaknesses, some of which are listed below. Remember that all of these are relative and the best person to talk to is your Smilemakers dentist! Porcelain-based, containing no metal. 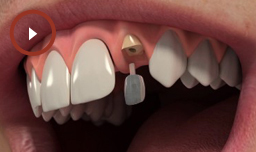 There are different types of All-Ceramic crowns each having their own characteristics. Porcelain can fracture and may not be suitable in patients with strong bites and grinding tendencies. Consist of an outer layer of porcelain bonded to an inner metal core. Porcelain can fracture, the weak point being the join between the metal core and the overlying porcelain. Consist of gold alloyed with other metals to improve the longevity. What are same-day crowns - Cerec? Imagine a dental practice where you can go and have your new all-ceramic crown made and fitted during a single visit and within an hour. This is what CEREC technology has made possible. Cerec technology also allows for the construction of porcelain onlays and veneers whilst you wait. Your dentist will prepare your tooth as for a traditional laboratory-made restoration but at this stage, instead of using "dental putty" to take an impression of your tooth, a digital image is taken using a special camera. This image is then converted into a 3D computerised model of your tooth, which is used as a guide to design your new restoration. Once your dentist is happy with the newly designed tooth, this data is sent to an onsite milling machine, which fabricates your new tooth from a high-quality ceramic block. Your dentist is in complete control of the final result - since the restoration is designed and fabricated from start to finish by your dentist, he/she has total control over how it will look and fit, whereas a crown made in a laboratory is under the control of the technician. The fact that Cerec restorations are milled from a single block of porcelain can limit their use in more aesthetically demanding cases – your dentist will guide you with regards to this.